New to the forum but have had a look around a few times. I have a 2016 BFB Megane GT with the 7 speed EDC. It's a bit clunky, but my main concern is a "chirping" sound on upshifts. It is constant on the 1-2, 3-4 and 5-6 shifts and I've noticed it happens now on downshifts. It can sometimes be accompanied by a light shudder or vibration. The dealer finally looked into it in October last year (after a couple of reminders) and after a drive, the foreman agreed there was an unusual sound. They plugged the car into a diagnostic machine and no faults were detected. The noise is getting more obvious with time and it is a worry. I see red when they do this. HTF do they expect their diagnostic machine to detect, say a dodgy bearing of an out-of-tolerance mechanical component? This might be a good thing. When it gets bad enough they will not be able to deny that it's an issue. Thanks everyone - all good suggestions, especially the audio recording. I've had the post-service dealer survey where I detailed the issue in free text fields. 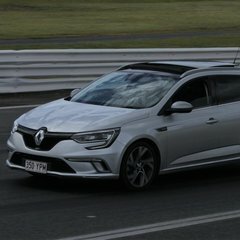 I was also sent a survey from Renault Australia where I also detailed the issue (and the dealer's poor responses) and ticked the box for them to make contact. Apart from this (oh, and a niggle with the audio-pod controls) I absolutely love the car's performance, steering, ride, handling and economy. There should be more of them on the road!!! They'll collate, process, analyse and chart the customer satisfaction data and discard the complaints as outliers. Then they'll have some meetings. You have one of the two clutchs failing. The fact that it makes the noise on every other gear is conclusive. That's my thinking - that it's a clutch or the gear set on that plane. There are two Renault dealers in Perth....neither seem particularly customer-centric. I'm documenting everything and will make a few audio recordings. Thanks everyone - appreciate the input. Hey mate and sorry to hear that your having trouble with your gear box. I have to say the dealers here in WA are pretty average. Not sure who you are seeing at the moment out of Melvile Osbourne Park or Wangara, but generally Id say when you talk to them don't talk to the service reception guy ask to speak to the service manager (Carl is the guy at Osbourne Park) and get them to have a mechanic join the chat. the skips at least two of the steps. Once you get them to agree its not normal then push that if it not normal and the computer doesn't know whats wrong then they might have to do some old fashioned Mechanical work and pull it out and manually inspect it. Do you have an ELM327 dongle? I was playing with DDT4ALL yesterday and there is a menu for checking the clutch. My car was off at the time so I didn't get any data but it said 5 - 15mm is normal so you might be able to find the problem yourself and show them, rather than them just checking for error codes and saying there isn't a problem. Thanks Aussie_Pilot. I bought the car from the Ossie Park crew and have it serviced there. Pretty sure it was the foreman (recommended by Carl) that drove with me to listen and then acknowledge that there was an abnormal noise. The car still had forward and reverse motion and the transmission wasn't on fire, so he didn't really see things as urgent. I will persist! And James - thanks for the tip about the ELM327 dongle and DDT4ALL software hack. I had to google it to get the gist so will look more closely at it and see if it is something I could manage without disabling the car. I used this for my info. From what I read (and tried) it won't write without toggling to expert mode then specifically telling it to write. As long as you don't toggle to expert mode you shouldn't break anything. I tried two things that didn't work, one meant the doors would only unlock with the fob instead of the button on the door, the other made the dash say error. Both easily fixed by changing back and writing again. I know this doesn't help now, but unless it particularly annoys you in operation- you may as well continue driving the car until it worsens. There will be a point where it's quite obviously broken and they will have no choice but to fix it. By then it might even be so bad you'll get a new Gearbox!